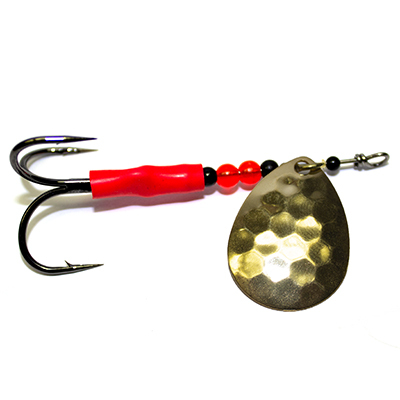 GDF® Spinners are hand-crafted out of the best components on the market, and are designed to attract fish in any surroundings you find yourself in. Try GDF® Spinners today! We have combined years of experience with in-depth study into what attracts fish to create a line of spinners that will catch fish in any condition you find. Our spinners have been field tested by expert fishermen & professional guides and have passed those tests with flying colors. GDF doesn’t give you random colors and pretty patterns with cheap hardware. We use only top quality components, such as top of the line hooks, solid bearings, premium beads, and GDF’s own specially designed blades that give you maximum visibility & vibration. Offering you the best quality finishes & unique painted blades on all our fishing tackle, GDF gives you the strongest & smartest spinners in the water. Fish GDF®. Fish the Best. GDFs “B-10” Line of Spinners and Hoochies work great behind Pro Troll Flashers, like the dynamic duos we offer, as well as all other 360 degree flashers. They feature our specially designed Scorpion Hooks, that allow you to run a larger hook without effecting the balance of your lure. 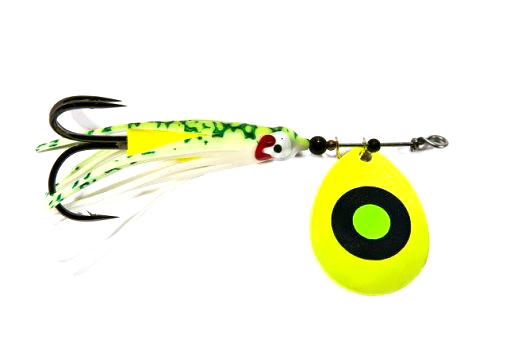 This larger hook means less missed hits, and more fish in your boat! !